The concept behind the Chevrolet Volt makes a lot of sense, though there&apos;s a major flaw in the plug-in&apos;s positioning. Few in the U.S. get their electric from a clean, alternative source. However, Chevrolet is about to set a precedent in the construction of EVs. The company&apos;s Detroit-Hamtramck assembly plant, which builds the Volt, is going solar. GM formed a partnership with DTE Energy for a 516-kilowatt installation, that will cover 264,000 square feet on six acres of land. On top of its sunny disposition, the plant will also soon benefit from other energy-saving initiatives like equipment that automatically shuts off when not in use, and more efficient lighting. To its credit, DTE Energy has pumped $3 million of its own money into the project, hoping to help roll out 15 megawatts of solar energy to the southern Michigan area. The logic is that the project will also inspire other businesses and individuals to harness the power of the sun. Let&apos;s hope for a beautiful summer if you&apos;re planning on scooping up a Volt. 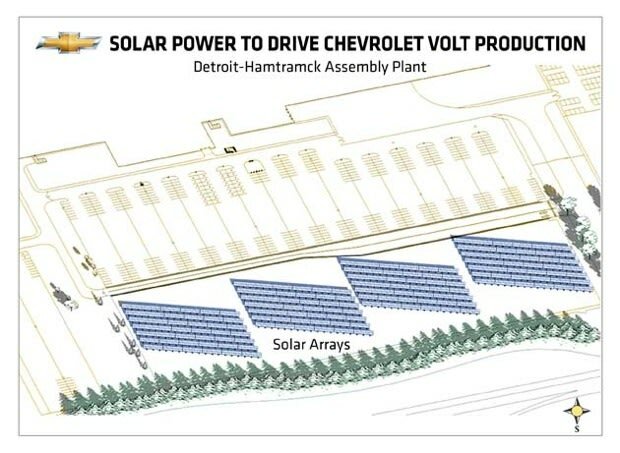 DETROIT – The largest photovoltaic solar array in Southeast Michigan will be built at the General Motors Detroit-Hamtramck assembly plant, turning sunlight into electricity to help power the home of the Chevrolet Volt electric car. The 516-kilowatt project, announced Wednesday by GM and DTE Energy, will generate electricity capable of charging 150 of the electric cars with extended-range capability every day for a year – a total of 54,750 Volts. The 264,000-square-foot project is expected to be completed at the end of the summer and will save the facility approximately $15,000 per year over the 20-year easement agreement. The Detroit-Hamtramck facility was chosen because it has available space for the array and because it is home to the Volt. "This array will significantly decrease energy consumption by combining solar power with ongoing efficiency tactics such as lighting and equipment upgrades and automating equipment shut-down," said Bob Ferguson, vice president of GM Public Policy. "Making sustainable choices is good for both the environment and our bottom line. Obviously cost savings is critical for GM, and the ability to save $15,000 per year while being environmental serves us well." The Detroit-Hamtramck installation is part of DTE Energy&apos;s SolarCurrents pilot that calls for enough photovoltaic systems to be installed on customer property or rooftops during the next five years to generate 15 megawatts of electricity throughout Southeast Michigan. DTE is investing $3 million in the array at Detroit-Hamtramck. "Our partnership with GM is another example of how our companies work to build a more energy-efficient and sustainable future," said Trevor Lauer, Detroit Edison vice president, Marketing & Renewables. "Our SolarCurrents program was designed to increase the demand for renewable technologies in Michigan, and it is our hope that installations like this one do exactly that." DTE Energy and GM will build the array on a six-acre tract of land located on the south side of the plant. This placement allows it to face true South to maximize solar output. The array will complement other green activities at the plant, which was recently named a Michigan Clean Corporate Citizen for its commitment to the environment. Environmentalism is evident by a 16.5 acre certified wildlife habitat on the site and the voluntary installation of an oxidizer that greatly reduces the amount of carbon dioxide and carbon monoxide released into the atmosphere. In addition, efficient lighting upgrades and other energy efficiency projects will save the plant nearly $3 million per year in energy costs. GM is one of the leading users of renewable energy in the manufacturing sector, deriving energy for manufacturing operations from solar, hydro, and landfill gas resources. In the United States alone, 1.4 percent of GM energy consumption comes from renewable resources. "We strive to reduce the impact our facilities have on the environment, and Detroit-Hamtramck continues to make progress in sustainability," said Ferguson.